When I told my wife and some friends that I was finally going to take their advice and read one of Louise Penny’s Inspector Armand Gamache novels, they all told me the same thing: You must read them in order! So of course I started with No 2, A Fatal Grace, and then turned to The Beautiful Mystery, which is No. 9. Well, I’m here to tell you that despite what everyone tells you, you can read Penny’s novels out of order and still live to sing their praises. Penny is too good a writer to make any one novel an absolute prerequisite for the next. They each stand on their own. But the recurring cast of characters—an entire town, not just a lone police inspector—grow and develop as time lapses, and presumably as the writer got to know and cultivate them. Reading the books out of order means you won’t fully appreciate the growth that makes this series unique. So many authors latch on to a great main character (Jack Reacher or Spenser come to mind) and allow only minor changes from one book to the next. Penny lets her characters live and change, much as we all do, and this is a major element of her success. It may even be the most important element. A Fatal Grace distinguishes itself with the very first sentence: “Had CC de Poitiers known she was going to be murdered she might have bought her husband, Richard, a Christmas gift.” That’s a terrific hook that allows Penny to create suspense without adhering to the tired requirement that a mystery writer put a body on the first page. It also allows her to spend the first sixty pages of the novel introducing you to the victim—and any number of people who have a motive to kill her. CC is, in fact, a marvelous character, full of mischief and meanness and evil, even unable to be kind to her daughter —in fact, the kind of character you love to hate and would be happy to murder yourself. Forutnately, someone does it for you. That brings Inspector Gamache to Three Pines, a tiny town in Quebec that serves as the setting for most of the Gamache novels. Though the population is small, it has its share of odd people, including an “elderly, wizened, bitter poet” who also heads the volunteer fire department (intensely rude but somehow still lovable), the gay couple that own the Bed and Breakfast, a retired psychologist who bought the local bookstore, and a large supporting cast of minor but very original characters. CC’s murder is a true mystery. How do you manage to electrocute someone on an ice pond in the middle of a curling match with dozens of spectators and escape unnoticed? But Gamache and his team are more than up to the task, figuring out not only who killed CC but also solving a related murder and untying several other mysteries in the process. Penny uses the history of Canada and the individual personalities of its inhabitants to illuminate her stories, taking on huge themes—love, friendship, and guilt—while keeping the crime central and staying true to the cozy mystery genre. Penny’s plots are complicated, too complicated in my view. There were times when I lost track of important elements or just stopped following the intricacies. And I found the tendency to leave one piece of the mystery unsolved so that you’re encouraged to read the next book in the series more than a bit annoying. 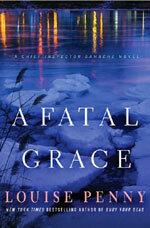 In Fatal Grace, for example, by the end we know that Agent Yvette Nichol poses a threat to Gamache's career, but if you want to find out how that turns out, you'll have to go to Book No. 3. Penny doesn’t need even that kind of small cliffhanger to get readers to pick up the next installment. Her writing is more than enough to do that. The newest installment in the series, No. 13–Glass Houses, has just been published, with No. 14 planned for a year from now. So best get cracking! Here's the list.